They did a great tag sale and clean out too! Nationwide Estate Sales did an amazing tag sale and great job cleaning out the house after. When they finished, everything was gone. Thanks So much Nationwide Estate sales! Marilyn, Jim and their staff did an amazing job with my sale ! They have a lot of followers and advertise a lot! There was a ton of traffic! When I got home so much had been sold! It made the job of getting rid of the leftovers so much easier. They are friendly, honest and hard working. I highly recommend them and have already recommended them to people I know who are also downsizing. Don’t look any further- book them! Thank you Marilyn and Jim!!! Nationwide Estate Sales is a professional and service oriented company who was able to not only help my family out with selling furniture and other property after my dad passed away, but they were also able to bring over 300 people to the estate sale in an area that I thought was going to be impossible to do. (East Hampton, New York) They took care of everything for us. This was an extremely difficult time and it's nice to know that a company like Nationwide Estate Sales exists to help make this time a little bit easier. The only thing left to say is "Thank You"
I want to thank you, Kevin and Laurie for yesterday. You and your staff were knowledgeable, friendly and professional. You made a difficult day much easier. I will be sure to recommend you to anyone needing these services in the future . Again, thank you and your staff. On June 2, Nationwide Estate Sales conducted an estate sale at our home in Manorville. Classified ads were placed in Newsday and Southampton. Our sale items were organized and tagged in a manner to make them more saleable. The personnel from Nationwide, Jim, Kevin and Marilyn, did an excellent job of maintaining order and selling. Any questions about price negotiation were quickly addressed with either myself or my wife. After the sale was over, Nationwide made contact with someone who couldn't make it to our home on June 2, but was interested in items that did not sell on the day of the estate sale. He came on the evening of June 4 and purchased several major items. 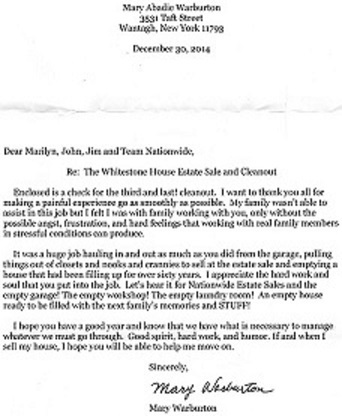 We would not hesitate to recommend Nationwide for their estate sale expertise, organization friendliness and follow-up. Thanks again for all your hard work last weekend at my Aunts house we will tell all our friends about your services you guys are the best! Nationwide Estate Sales conducted an estate sale at my home a week before I sold the house. My family and I had lived there for 10 years and I was moving to a apartment so there was a lot to sell. They conducted the sale with the utmost professionalism and made it effortless for me. They did a great job of advertising the sale the week before and handled the volume of traffic well. It was a painless way to get rid of furniture and other items I did not want to take with me to the new place, and I netted a nice amount of money. I highly recommend them. Jim, Marilyn and their staff successfully liquidated most of the contents of our home in preparation for a move. They were professional from the first meeting, inventory, set up and day of sale. Even with the inclement weather the day of sale, we had an excellent turnout because of their reputation, their advertising on their website and other sources and links. Their staff was personable, energetic, professional and exhibited great character in handling a large volume sale with honesty and integrity. I would highly recommend their services unconditionally. I want to take a moment to thank you, your family, and Nationwide Estate Sales for an amazing and professional job. We had a very large and eclectic mix of furniture, artwork, collectables, and personal items to liquidate and you and your team did a great job. We are both thankful that we chose your team to help us with this difficult task. Thanks so much for everything you did for our estate sale this past weekend.We were all very impressed with the service you provided, and will certainly recommend your company to friends. It was a pleasure to work with all of you, and you helped a lot with a stressful situation for our family. Best of luck to your company in the future, and maybe we will run into you at some estate sales down the road! Marilyn and Jim did a fabulous job organizing, setting up and running our estate sale last week. Everything went smoothly and we had a large crowd from beginning to end. Thanks so much Marilyn and Jim for all your hard work! Choosing Nationwide Estate Sales was one of the best decisions I ever made. Overwhelmed with moving and downsizing our home, I was left with rooms full of furniture and antiques that I would not be in need of in the new space. Nationwide stepped in organized, priced and staged everything for me. Nationwide is a family owned and operated business and I found them knowledgeable courteous and a pleasure to work with. They did a great job and I would highly recommend them to anyone!" I want to thank Jim and Marilyn at Nationwide Estate sales for all there hard work at my Moms estate. They took care of everything for me during this difficult time. There knowledge and friendly service helped get loads of items sold at a fair price. Once the sale was completed Nationwide's team came then following day to empty the house and broom swept so I could do the closing with the new buyers. Everything was smooth and hassle free. Bring people to the house to purchase some of the home items. Clean out of the house for preparation for closing. Things went very well. They were upfront on what they could and couldn't do or sell and the cost of different services. They were straight forward about setting up the appointment when the buyers were available. During the sale, everyone attending was friendly, clear and honest. Proceeds from the sale offset about half of the cost of the services which what was expected. The clean out occurred after the sale. The staff was courteous. Thank you for all your wonderful help this past weekend. The team at Nationwide helped me every step of the way. I had to stay in Florida and hired Nationwide to conduct my sale in Carmel. They did a wonderful job and i could not be happier. We will tell all our friends to hire them they are the best! Nationwide estate sales is the best! Marilyn and Jim offer top service. They return calls, show up when they say they will and really take care of the difficult business of unloading stuff from an estate. My dad passed away in December, 07, and we had the inevitable task of moving my mother out and selling her house. Marilyn and Jim made the most difficult part easy, that is, selling whatever my parents had collected for over 60 years, for a decent price. We didn't know where to begin. One call to Nationwide, was all we needed to do. They are professional, courteous and efficient. You don't need to call anyone else!!! 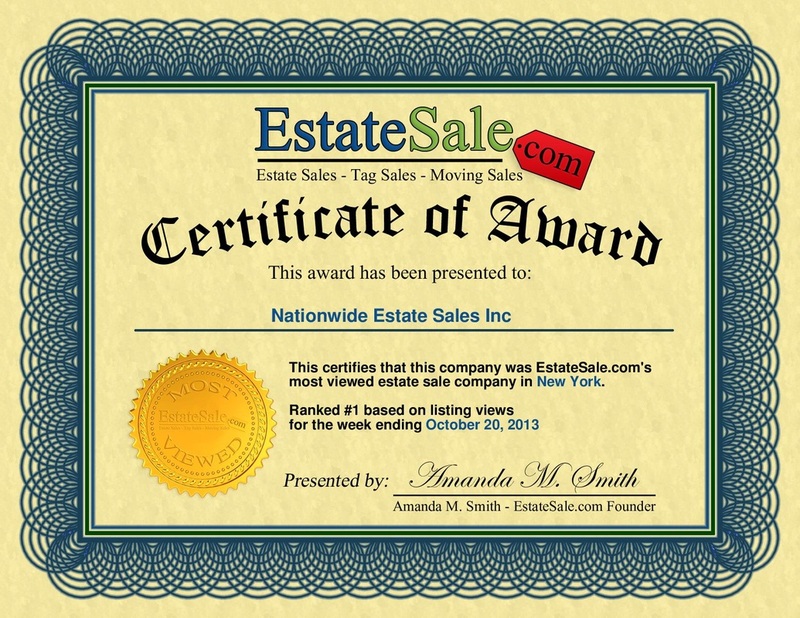 Nationwide Estate Sales is a top notch organization that I would highly recommend. From the time of first contact through the final minutes of the sale, Jim, Marilyn and the team handled everything efficiently and professionally. Their charges are very clearly outlined in a hard copy and they respond to questions promptly. We had quite a bit of things to sell for my cousin's estate and we really needed to get rid of as much as possible during the two-day sale. We sold more than I ever thought we could, and made a good profit from the sale. I was extremely impressed with the way they handled negotiations and difficult customers. You could not ask for a better company for estate/tag sales. The team from Nationwide Estate Sales did a great job handling our estate sale. They handled all of the logistics like advertising, showcasing the items at the sale and the details of each sale. As a result of their efforts we had much better turnout at the sale than we could have gotten on our own. They also came very prepared and had researched the items for sale so as to get us the best value from the sale. All of this was done seamlessly and professionally. We can’t recommend them highly enough. Great job guys! My mother was overwhelmed with the amount of things she would need to get rid of after living in her home for 25 years. Jim and his staff came and made it extremely easy. They were able to sell almost everything, which has made my mother a lot less nervous about moving. I would definitely recommend this company. Super company to deal with thanks so much! 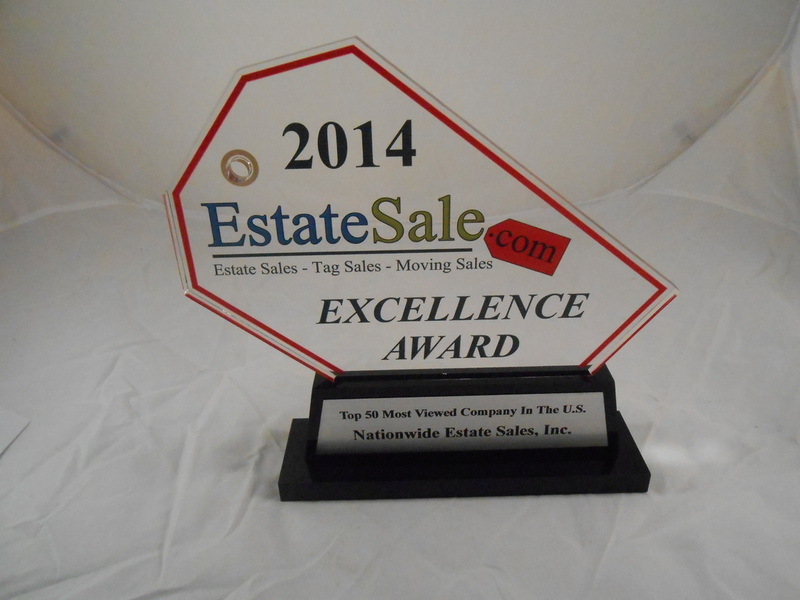 Working with Nationwide Estate Sales was easy and smooth. They came when they said they would and called when we had a set time to speak with one another. The handling of the sale was professional. These people know what they are doing and they do perform. If there was doubt with a selling price, they always came to me to verify. The house was left in as clean as condition as possible. We want to thank you and your staff for the great job you did setting up and managing our estate sale last Saturday in Manorville. From your initial assessment, set up and sale, it was smooth sailing. The sales exceeded our expectations! You and your staff were so professional, pleasant, knowledgeable and honest. You really know how to price and sell everything. We couldn’t be more happy with the service you provided and would feel confident to recommend your services to family, friends, and associates. My family and I thank you and wish you continued success in your future.